Other than the church, the public house (or inn, alehouse or tavern) is our oldest social institution in built form. We still have some medieval inns – the Angel at Grantham and the George at Glastonbury, both fine and rare examples of secular gothic architecture – performing their original purpose. As Tom Burke wrote in his book on The English Inn (1930), ‘By a tour from inn to inn you may make a connected study of domestic architecture from the fourteenth century to the twentieth.’ A pub crawl can be an architectural education (the late Ian Nairn included no less than 27 hostelries in his Nairn’s London in 1966). Many of the old inns that stand proudly in the centres of towns and villages, once so important for transport, are vernacular buildings, half-timbered perhaps. In the Georgian period – the heyday of the stagecoach – they might be given a grand brick front, like the George at Stamford. The number of public houses expanded greatly in the 19th century, particularly in cities. Now they assumed a characteristic urban form, like large and opulent classical houses, embellished internally with mirror, cut glass and gilding to make them glitteringly attractive. Pubs were built or rebuilt in a series of booms and slumps, a process partly dependent on politics, as Tory governments tended to favour the brewers. This process – charted by Mark Girouard in his 1975 book on Victorian Pubs – culminated in a crash in 1899. And many of the extravagant palaces that resulted were designed by architects, but they were specialists and remain obscure: Shoebridge & Rising, Treadwell & Martin, Fletcher & Migotti (‘Why did they so often hunt in pairs?’ wondered Girouard). Respectable architects, designers of churches and country houses, did not engage in this vulgar trade. 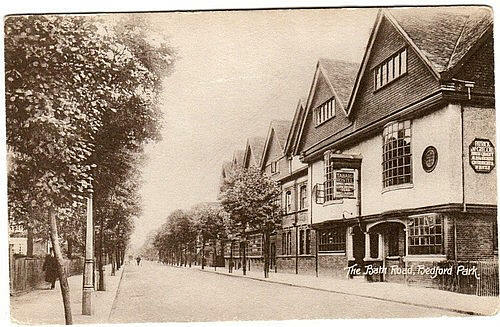 The exception was Richard Norman Shaw, who designed the pub for the new ‘Queen Anne’ suburb of Bedford Park. Significantly, it is called the Tabard, evoking Chaucer and Olde England, and in appearance is in deliberate contrast to a contemporary gin palace. Those who have written about pubs and inns always seem to have felt they were under threat, and certainly their history is one of constant change. Girouard noted that ‘London is full of dead pubs. In Oxford Street…there were nineteen pubs in 1890; today there is only one.’ The advent of railways in the mid 19th century was a catastrophe for the old coaching inns, taking away their trade. 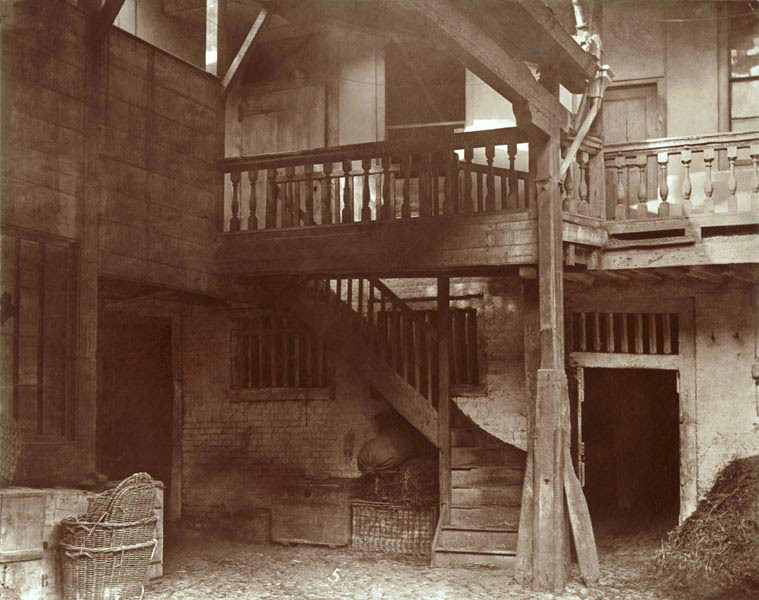 In London they disappeared – the Society for Photographing the Relics of Old London recording several, like the Oxford Arms in Warwick Lane, in their last sad days. Now we have only the George in Southwark, that precious galleried fragment off Borough High Street, to show us what they were like. The great threat in the early 20th century was temperance and, worse, prohibition. One answer was the ‘improved’ public house, a building which, like the Tabard, presented a wholesome, rustic, pre-industrial Arts and Crafts image. Many are to be found in and around Carlisle where, in 1916, under the Defence of the Realm Act, pubs were nationalised as a response to the alarming drunkenness of the large Irish workforce introduced to build munitions factories. Many pubs were closed; others were rebuilt to Harry Redfern’s designs. Intimate drinking spaces were abolished and the new buildings were usually in a suave and genteel Tudor style. Redfern’s work was very much the model for the type of improved public house built between the world wars. To resist the real threat of prohibition, such new buildings looked as different as possible from the urban Victorian tavern; food was served, and they were meant to be places to which women, even children, might go without fear of degradation. Many were in the suburbs and built along the new arterial roads being laid out around big cities. The advent of the motor car – which gave a new lease of life to many old coaching inns along main roads – encouraged the building of these ‘roadhouses’, which, together with cinemas, are the characteristic building types of the period. Such buildings were illustrated and described in The Renaissance of the English Public House (1947), a book by the architect Basil Oliver. They reflect the fashionable styles of the period: many were Tudor; others neo-Georgian and a few pseudish, or modernistic, or art deco. The doyen of roadhouse architects was E.B. 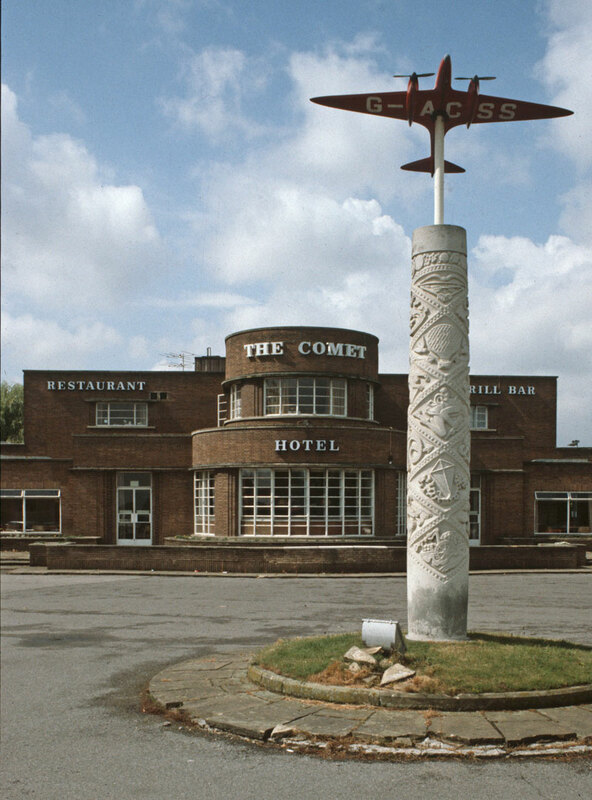 Musman, who could design both the Scots baronial Berkeley Arms at Cranford and the streamlined modernistic Comet Inn at Hatfield – named after the 1934 record-breaking aeroplane. These interwar pubs have yet to find their historian. And now they are under threat. Pubs have always suffered from destructive changes in fashion but the situation today is much worse. Cheap booze in supermarkets and the smoking ban, combined with escalating property values and a relaxation of the planning laws (allowing old pubs to be converted into houses or whatever) have resulted in an alarming and continuing number of pub closures – 21,000 since 1980. And a high proportion of these closures seem to be of interwar pubs. 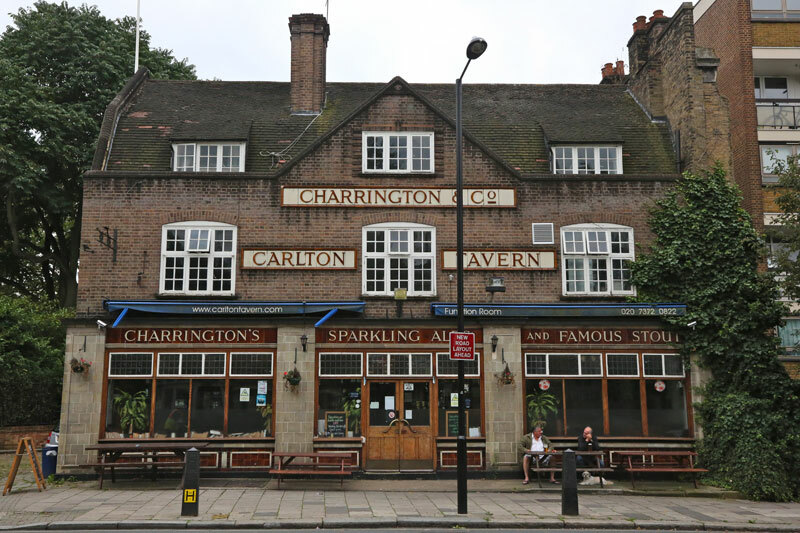 An extreme but significant case was that of the Carlton Tavern in Maida Vale, a building of 1920–21, which earlier this year was suddenly and illegally demolished by its new owners, after a proposal to replace it by flats had been turned down and while it was being considered for listing by English Heritage. Other such pubs have been converted into restaurants or made into hotels – the fate of the Comet Inn – or just boarded up and abandoned, ripe for demolition. From the July/August issue of Apollo: preview and subscribe here. ‘(the late Ian Nairn included no less than 27 hostelries in his Nairn’s London in 1966)’…we believe you meant ‘no fewer than 27’.